Vitreous hemorrhage (VH) is defined as the presence of blood within the vitreous cavity, which is the space lined posteriorly by the retina and anteriorly by the ciliary body, zonular fibers, and posterior lens capsule (Figure 1). 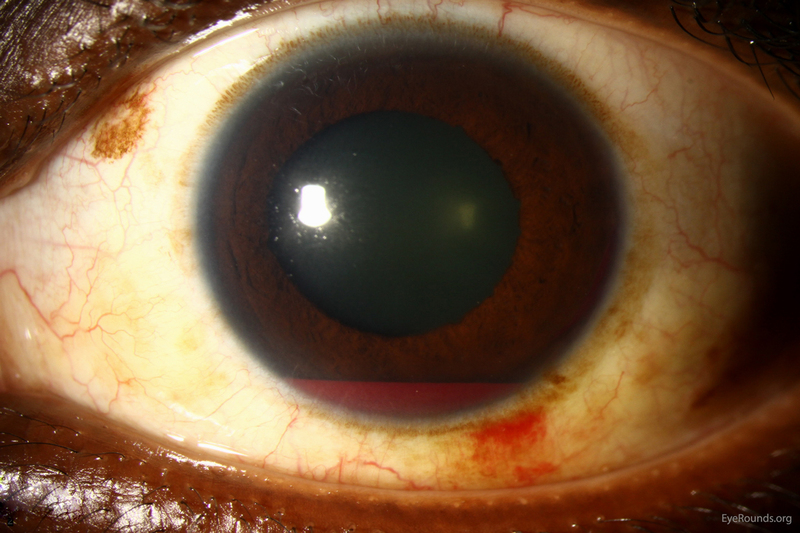 Vitreous hemorrhage is not uncommon with an incidence of seven cases per 100,000. However, the diagnosis of VH alone is not specific and the list of causes of VH is extensive (Table 1). Fortunately, three conditions cause 59 to 88.5% of VH cases: proliferative diabetic retinopathy, posterior vitreous detachment (PVD), and ocular trauma . In most circumstances, normal vessels only bleed in the setting of trauma or PVD. 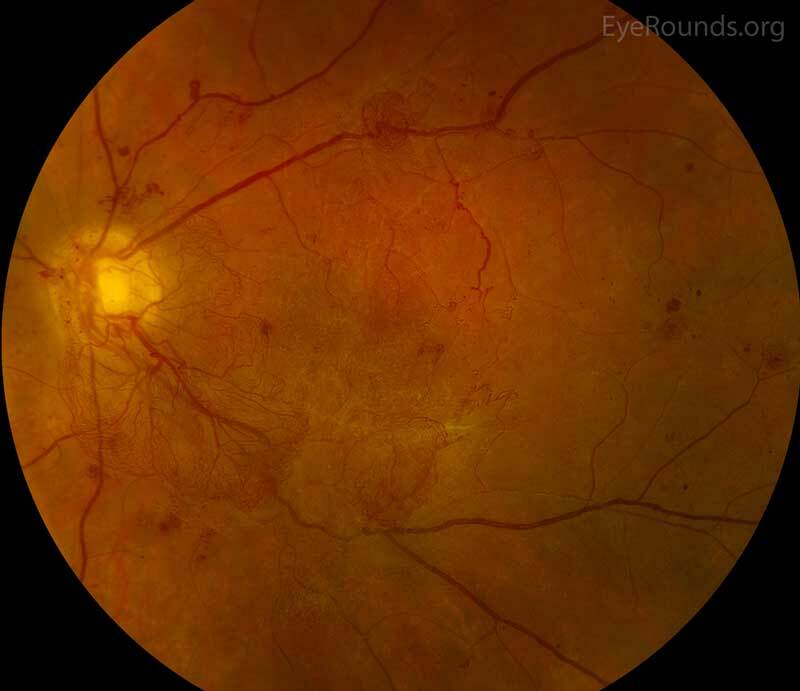 Conversely, patients with a history of chronic retinal ischemia (e.g., diabetic retinopathy) can develop abnormal fragile vessels (i.e., neovascularization) with a propensity to leak. 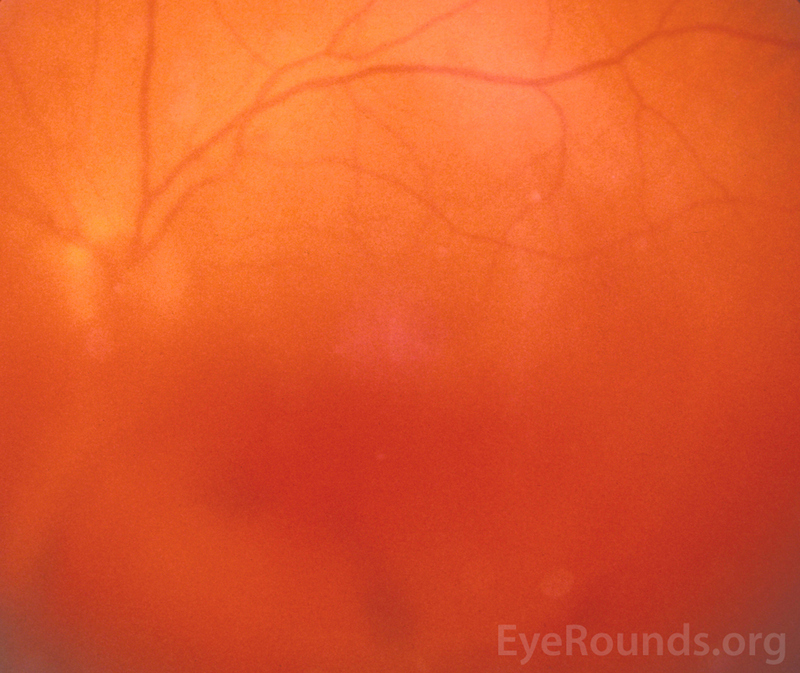 This article reviews the most commonly encountered causes of vitreous hemorrhage. The relative incidence of causes of vitreous hemorrhage are included in parentheses. The diagnoses not specified make up the remaining 13% of cases and are therefore quite rare. The vitreous is an optically clear "jelly" that occupies almost the entirety of the back of the eye and is anchored to the lens, optic nerve, and retina. It constitutes about 80% of the total eye volume. The vitreous is composed of collagen, hyaluronic acid, and water and plays a role in growth modulation of the eye during development. The vitreous has a complex system of canals, which are filled with vitreous humor . Normally, the vitreous is closely approximated to the adjacent structures of the eye, but as we age the vitreous begins to liquefy and shrink (i.e., vitreous syneresis) and eventually detaches (i.e., PVD). Symptoms of vitreous hemorrhage vary from sudden, painless complete vision loss to a mild haze. Patients most often describe new floaters, shadows, "cobwebs," or less commonly a red tint to their vision. Depending on the underlying mechanism, patients may also describe flashes of light in their peripheral vision (i.e., photopsias) from traction applied to the retina. Density and location of the hemorrhage governs the severity of symptoms. Visual acuity can be quite variable among patients. Diabetic retinopathy (DR) is a common cause of VH. DR affects 5.3 million Americans and is the most common cause of vitreous hemorrhage, constituting 31-54% of all VH cases . In DR, chronic hyperglycemia causes endothelial damage and basement membrane thickening, leading to vessel weakening and obstruction. Vessel damage in DR incites chronic ischemia, which promotes cells to release angiogenic factors and leads to new blood vessel growth (i.e., neovascularization) or proliferative DR. Unfortunately, the new blood vessels are fragile and likely to bleed (Figure 2) . You can learn more about diabetic retinopathy here. Due to the high prevalence of diabetes and diabetic retinopathy, it should remain high on the differential for vitreous hemorrhage. Retinal Vein Occlusion. Central retinal vein occlusion (CRVO) and branch retinal vein occlusion (BRVO) (Figure 3), account for 4-16% of all vitreous hemorrhages . It is the second most common retinal vascular disorder after diabetic retinopathy. Retinal vein occlusion pathogenesis is multifactorial, including arterial disease, mechanical compression, degeneration of venous walls, and hypercoagulability leading to venous occlusion . Acutely, venous stasis can damage venules allowing extravasation of blood into the vitreous. After an occlusive event, the retina is subject to chronic ischemia leading to compensatory angiogenesis and increased risk of VH. Sickle Cell Retinopathy. Sickle cell retinopathy is a rare cause of vitreous hemorrhage, making up an estimated 0.2-6% of all cases of VH . Proliferative retinopathy can develop in both homozygotes (SS) and heterozygotes (SC), although it is more commonly seen in heterozygotes (SC). In proliferative sickle cell retinopathy, characteristic "sea fan" pre-retinal neovascularization occurs, which can bleed into the vitreous . More information on sickle cell retinopathy, including diagnosis and management, can be located here. AMD with Neovascularization. 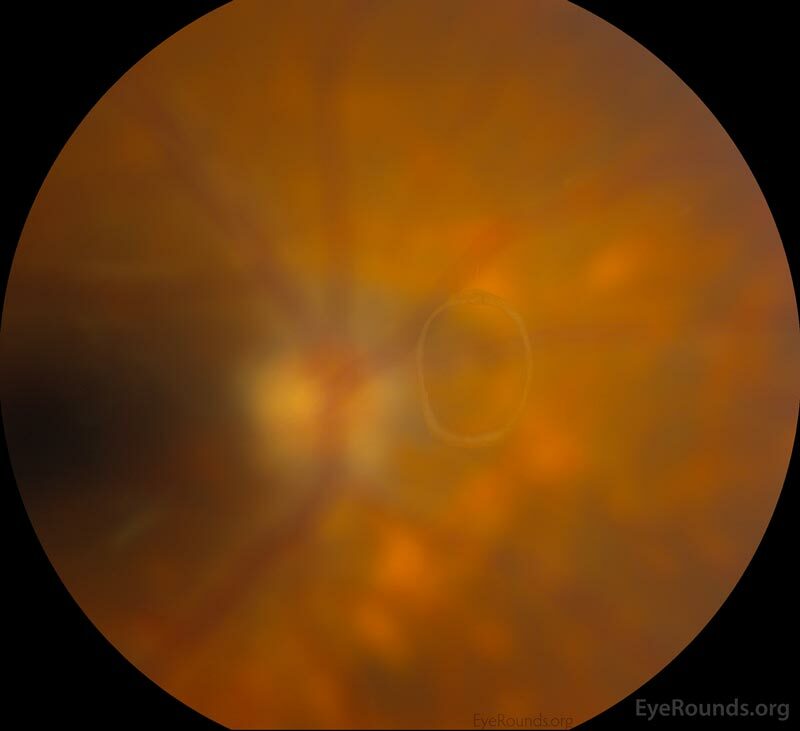 Age-related macular degeneration (AMD) is the culprit in 0.6-4% of VH cases . "Wet" AMD is a risk for vitreous hemorrhage because the vessels of the choroid are diseased. As AMD progresses, Bruch's membrane, which is the innermost layer of the choroid, begins to break down. These breakdown products stimulate angiogenesis of the underlying choroid. New vessels can infiltrate through Bruch's membrane and bleed into the retina and vitreous . The Medical Student Guide to Age-related Macular Degeneration is a good resource to learn more about the pathophysiology, diagnosis, and treatment of AMD. The vitreous undergoes syneresis as we age, affording the opportunity to peel away from attachments in a process known as a posterior vitreous detachment (PVD). 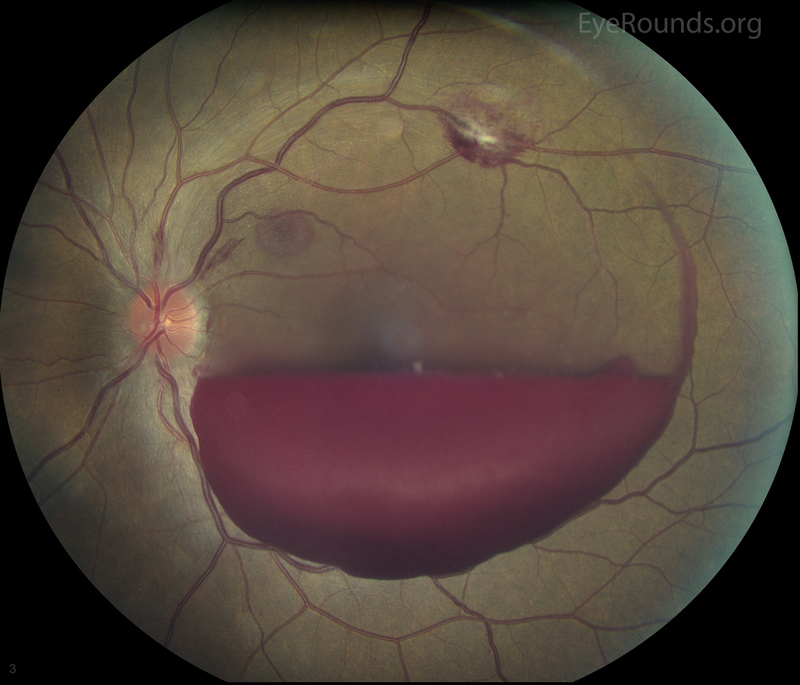 When vitreous becomes completely separated from the optic nerve head, a Weiss ring (Figure 4) may be visible on fundus exam. A PVD can create enough traction to tear or detach the retina. Patients presenting with PVD without retinal involvement can still have a vitreous hemorrhage (4-12% of patients), although VH is more likely in the setting of retinal tear (11-44%) . To learn more about retinal tears, follow this link. Direct eye trauma is the most common cause of vitreous hemorrhage in patients younger than 40 years old and in patients without a history of eye disease (e.g., proliferative retinopathy) . In the setting of penetrating trauma, blood can extravasate into the vitreous from neighboring tissues or injured intraocular structures along the foreign body path. It is pertinent to elicit a recent history of falls, especially in the elderly. If VH is seen on exam in an infant, abusive head trauma should be considered. 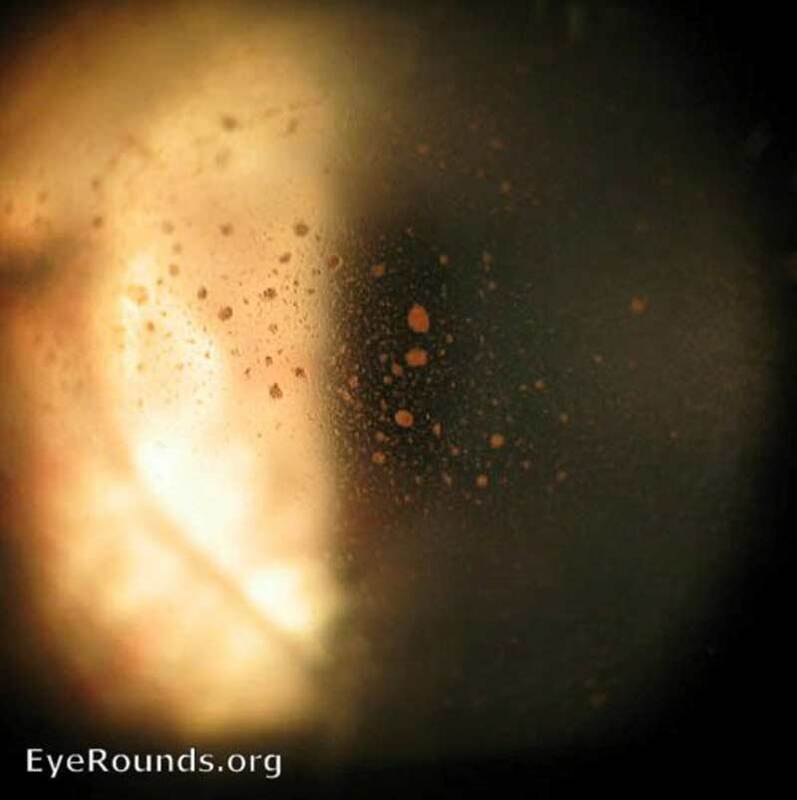 Terson syndrome is a rare cause of vitreous hemorrhage (Figure 5); it is responsible for less than 1% of all cases of VH . Terson syndrome occurs when VH is associated with subarachnoid hemorrhage (SAH) or intracerebral hemorrhage. The pathogenesis is disputed; proposed mechanisms include SAH tracking through the optic nerve sheath or effusion of the optic nerve sheath leading to mechanical compression of the central retinal vein and venous hypertension . A prospective trial found that Terson syndrome had an incidence of almost 20% in patients presenting with SAH. Low Glasgow Coma Scale, high Hunt and Hess grade, and high Fisher grade were found to be associated with higher incidence of Terson syndrome. SAH patients with Terson syndrome had worse neurological outcomes at three months than those with SAH only . Blood in the anterior segment can move posterior and cause VH. In pseudophakic or aphakic eyes, the capsule or zonule integrity has been altered from surgery or congenital defects. This structural change allows for hemorrhage in the front of the eye to infiltrate into the vitreous posteriorly. For example, those presenting with a hyphema (Figure 6) in the anterior chamber may also have VH. The iris or ciliary body can bleed into the vitreous, such as in cases of intraocular lens malposition or in patients after surgery of the iridocorneal angle (e.g., trabeculectomy). Some interesting etiologies of VH from anterior segment pathology include Uveitis-glaucoma-hyphema (UGH) Syndrome, Fuch's Iridocyclitis, and Swan Syndrome. In the setting of VH, there may be contributing factors, such as medications or other medical conditions. The use of medications, particularly anticoagulants, may affect a patient's risk for VH. Witmer, et al. found that patients on aspirin, clopidogrel, or warfarin presenting with signs and symptoms of acute PVD had vitreous hemorrhage 43% of the time, while controls had an incidence of 31% (P=0.03) . However, the Early Treatment Diabetic Retinopathy Study Number 7 did not find an increased risk of VH in patients taking aspirin . Supra-therapeutic levels of anticoagulation, thrombocytopenia, or other hematologic disorders may cause VH, although these cases are rare . In patients on anticoagulation who are diagnosed with VH, most physicians will not discontinue anticoagulation in order to aid in resolution. The risks of stopping this medication could be life-threatening (e.g., stroke) and outweigh the benefits (e.g., faster recovery of vision). Concerns arising about a patient's anticoagulation status after VH would be best addressed through a discussion with the prescribing physician and ophthalmology. All patients with suspected vitreous hemorrhage should undergo visual acuity, slit lamp biomicroscopy, and dilated fundus examinations. It is crucial to rule out retinal tear or detachment in all VH cases with either scleral depression or ultrasound (B-scan) if the view of the retina is obstructed by hemorrhage. 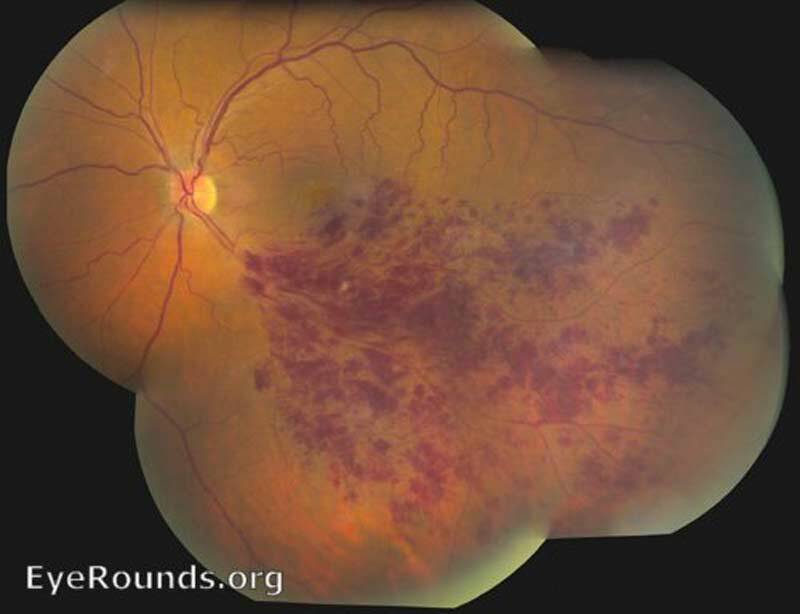 Even patients with a history of proliferative retinopathy can develop PVD or retinal tear. In severe hemorrhages, there may be a loss of red reflex or a relative afferent pupillary defect. Schaffer's sign (Figure 7) is the presence of pigment granules in the anterior vitreous. Tanner, et al. found that a positive Schaffer's sign had a sensitivity of 95.8% and a specificity of 100% for retinal break . In patients with a history of proliferative retinopathy (e.g., DR), examining the fellow eye will help assess the degree of retinopathy and likelihood of VH from a proliferative etiology. If there is high suspicion for intraocular foreign body, a B-scan or CT scan should be considered. There is utility in fluorescein angiography in cases of indolent bleeds of unclear origin, neovascularization, or venous occlusion. VH from the anterior segment can generally be detected on slit lamp or gonioscopy examination. The prognosis and management of VH depends on the underlying pathology. VH clears slowly, on the order of 1% per day . Conservative measures, such as head of bed elevation, are often taken to treat vitreous hemorrhage. Patients with a low risk of recurrent bleeding (e.g., PVD) have a good prognosis for resolution of symptoms and regaining baseline visual acuity. Patients with hemorrhage secondary to diabetic retinopathy or AMD have the worst prognosis for clearing VH and regaining baseline visual acuity . Treatment beyond conservative measures is guided by disease and severity. Intravitreal anti-VEGF drug injections are the first line treatment for proliferative retinopathies and AMD with neovascularization. Panretinal photocoagulation (PRP) is used in proliferative diabetic retinopathy to reduce the amount of angiogenesis. Laser treatment may also be pursued in the setting of retinal break with impending retinal detachment. The definitive treatment for non-clearing vitreous hemorrhage is pars plana vitrectomy, in which the vitreous is surgically removed and replaced with saline. Most ophthalmologists will observe VH for at least six months before proceeding with vitrectomy. Spraul, Christoph W, Grossniklaus HE. "Vitreous hemorrhage." Survey of Ophthalmology 42.1 (1997): 3-39. Yanoff M, Duker JS. "Vitreous Anatomy and Pathology." Ophthalmology. 2008. Bond-Taylor, Martin, Jakobsson G, Zetterberg M. "Posterior vitreous detachment–prevalence of and risk factors for retinal tears." Clinical Ophthalmology (Auckland, NZ) 11 (2017): 1689. Jaulim, Adil, et al. "Branch retinal vein occlusion: epidemiology, pathogenesis, risk factors, clinical features, diagnosis, and complications. An update of the literature." Retina 33.5 (2013): 901-910. Gress, Daryl R, Wintermark M, Gean AD. "A case of Terson syndrome and its mechanism of bleeding." Journal of neuroradiology. Journal de neuroradiologie 40.4 (2013): 312-314. Czorlich, Patrick, et al. "Terson syndrome in subarachnoid hemorrhage, intracerebral hemorrhage, and traumatic brain injury." Neurosurgical review 38.1 (2015): 129-136. Witmer, Matthew T., and Steven M. Cohen. "Oral anticoagulation and the risk of vitreous hemorrhage and retinal tears in eyes with acute posterior vitreous detachment." Retina 33.3 (2013): 621-626. Early Treatment Diabetic Retinopathy Study Research Group. "Early Treatment Diabetic Retinopathy Study design and baseline patient characteristics: ETDRS report number 7." Ophthalmology 98.5 (1991): 741-756. Tanner, Vaughan, et al. "Acute posterior vitreous detachment: the predictive value of vitreous pigment and symptomatology." British journal of ophthalmology 84.11 (2000): 1264-1268.